Cassavetes only did two neo-noir crime movies, the other was The Killing of a Chinese Bookie from 1976. This was also a good film worth checking out and I hope to re-watch it and review it later on this site. 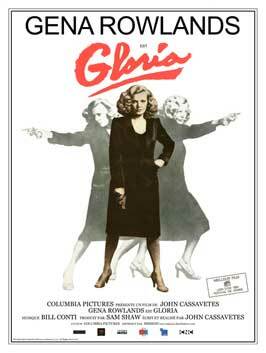 Gloria is played by Cassavetes wife, Gena Rowlands. Rowlands was nominated for an Academy Award for her role. Gloria is a battle tested mob moll. She shows up at a friend’s apartment to find the family in distress. The family is marked by the mob for death and know it is happening soon. The father played by Buck Henry has evidence in a book and they found out about it. The family asks Gloria to take their son and hide him before the killers get to them. She does and our adventure begins. The son is played by John Adames in his one and only movie role. Adames has flashes of brilliance with some well written lines and other times you can see he is just a kid with no acting experience and looks awkward and out-of-place. You can see Cassavetes got a lot of inspiration from old noir and gangster movies for his dialog in this film. Gloria is a hardboiled female character, which in itself had to be pretty original for its time. She has a feel of realism in Rowlands portrayal, she isn’t perfect and just, and struggles with what is the right thing to do and what is the smart or easy thing to do. This film was re-made with Sharron Stone in the lead in 1999, I have not seen this film so I don’t know how it compares. This Gloria is not a perfect film, but is an interesting watch, This is for fans of early independent films and those that like gritty 70’s neo-noir. ← News: Luther is back! Gena Rowlands is fantastic. Love, love this film. Not a big Cassavetes fan, but Rowlands’s superb performance is hard to resist.